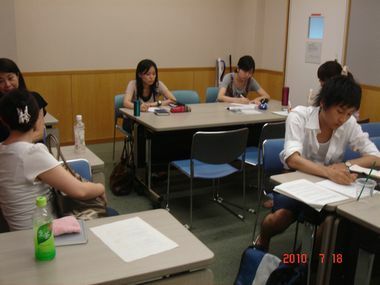 The JFS Youth Team organized the Building Journalism Skills Student Seminar on July 18, 2010, in Tokyo, to share with the world environmental activities conducted by students in Japan. The JFS Youth Team seeks to spur an increase in the environmental activities of students in Japan. This time, student participants brought information about environmental activities in which they were involved or interested, and began by writing a Japanese article about those activities. Next, participants translated their articles into English based on advice from a JFS intern from the United States and other JFS Translation Team Members. The activities selected by participants included an umbrella lending service in Shibuya, Tokyo, environmental activities led by university student clubs, a hands-on project to learn about the production of biodiesel with sunflowers, and a citizens' group established by youth. Participants were able to contribute to environmental conservation and the creation of a more sustainable society in this seminar by sharing information about an environmental activity of their choice with the rest of the world. In addition, they were also able to learn about other exciting environmental activities, improve their writing skills and polish their English. In the past, the JFS Youth Team has held a variety of events geared toward young people, but this is the first event at which participants were able to experience the full process of writing a Japanese article and subsequently translating it into English. The participants and organizers of the seminar hope to hold similar events again in the future, and are enthusiastic about introducing student environmental activities in Japan with the rest of the world, thereby creating connections with students throughout the world.